So I was back from HK about a week ago (SOBS) and I've been to quite a nice cat cafe!!! I swear this was the first place I put into my itenary because OMG, CATS! 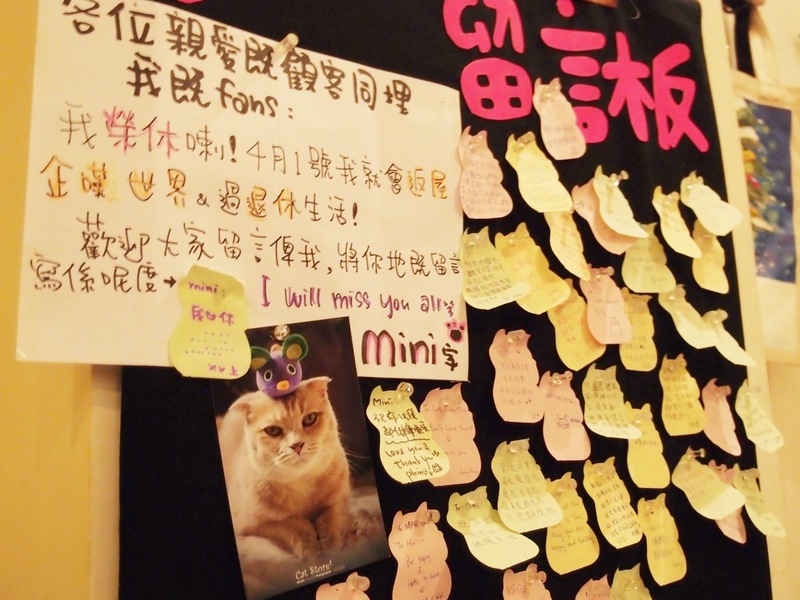 It's called Cat Store Cat Cafe or Ah Meow Cat Cafe (阿貓地攤). We (mummy, bro & I) went there on a Saturday night after shopping around Causeway Bay, and boy it was like finding a needle in a haystack!!! We spent about an hour rounding the area to find out it was actually really nearby -.- No thanks to the shop assistants in the tens of shops that we asked directions from. This was the tabby that came to our table! Bless you! Smoked Salmon Pizza which was okay tasting (come on, its for the decorations anyway) and bro's tofu baked rice which I thought.. Nah. Mum was too afraid of the cats to even eat anything HAHAHAHAHA. I kid. Decided to try their Honey Mixed Balls and I'm so sorry, this sucked. Its like adding real honey onto fish balls and meat balls. The taste don't blend and it just tastes really weird. It was pretty expensive for a dish like this. Please try other stuff when you're there! Interior of the place. They have like a carpentry workshop inside! Also, a toilet (for humans, hahaha) and cubby holes for cats to rest! They also sell cat stuff like souvenirs and decoration items in the shop. Bro should stop being popular among cats. Pfft. My fave meow there! She's 4 years old, and her name is Mini~ She looks really mini for a 4 year old, huh? And she has a bro called Cooper.. Erm.. Expensive reference :P She'll be retiring from the cat cafe soon (already did haha) and cafe goers can leave a message for her. And this is Mini's message board! where is this in HK exactlly? :D I wanna go there too!!!!! !